Last week I had a little pot luck get together with my friends David and his gf Siew Li. Yes. This was pre-detox and also mainly why we decided to go vegan. There was no specific theme but Frank requested for beef (about the only animal he would consume, really) and I wanted to make a French dish so here’s what I come up with: Daube of Beef. What’s the difference between Daube and Beef Bourguignon, then? As far as I can see from different recipes I’ve understood the main differences, apart from regions they originated from, are the herbs and spices being used. Daube uses cinnamon, star anise, orange peel in addition to thyme, bay leaves which are also used in Bourguignon. Both equally delicious though. Ideally, this recipe works best for beef cheeks but as it turns out, I have to pre-order it at least 10 days in advance so I had to go with other cuts instead. I’ve used a mixture of chuck steak and rump, both suitable cuts for braising. Cooking this dish was not without its drama. As the beef needs to marinate overnight I’ve had it all prepare for the next day only to realise: THERE WAS NO GAS!!! Of all days they have decided to schedule maintenance and the gas supply was turned off the whole afternoon…….. I had to improvise. Because I ain’t no quitter!! So there I was, standing in front of an oven in maximum heat and attempting to oven fry the beef, and vegetables. Damn, it was tedious! Not to mention the little burns I got on my fingers taking the casserole in and out of the oven so many times. Though I can tell you that the beef still turned out very tender and the sauce was nothing short of amazing! So if for whatever reason you don’t have gas at home (well let’s hope not), you can try this method. Oven mitts essential. The gas did return that evening so I could fry the garnishes and also make the mash. I think I lost a lot of hair that day due to stress but thankfully none ended up in the dish. And here, is the recipe in an ideal world when Gas supply is not interrupted. Time consuming but oh-so-worth it! 1kg of beef (rump+chuck steak), cut into 6cm pieces) – if using beef cheeks use about 4 of them. 4 eschalots, halved or quartered depending on size. 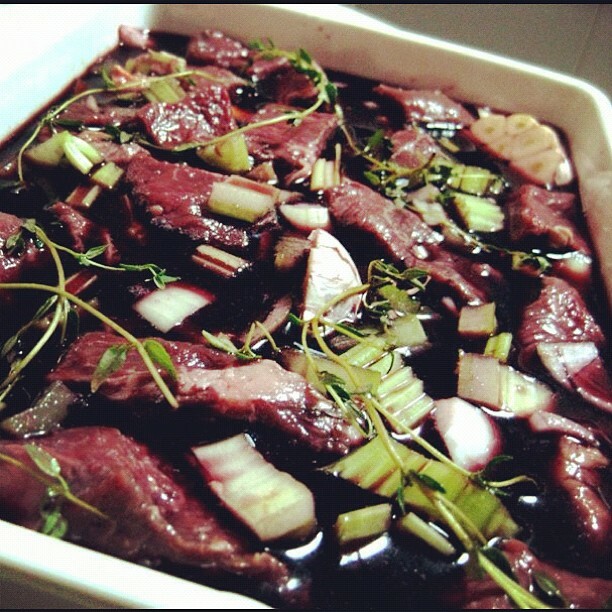 Start a day ahead, place beef, onions, wine, carrots, thyme, celery and garlic in a flat dish. Cover. Refrigerate overnight. Remove beef and pat dry with paper towels. Strain marinade through a fine sieve into a saucepan. Reserve vegetables and garlic. Place pan over medium heat, bring to a boil, then set aside. Meanwhile, preheat oven to 150 degree C. Heat a large casserole over high heat. Add tbs oil and half the beef, and cook for 2 minutes each side until browned. Transfer beef to a plate. Repeat with the other half. Add reserved vegetables and garlic to casserole and cook, stirring occasionally, for 5 minutes or until softened. Stir in tomato paste, then flour. Strain wine mixture into casserole and stir to combine. Return beef to casserole with stock, orange zest, cinnamon, star anise and bay leaves, then bring to boil. Remove from heat, cover surface with baking paper, then transfer to oven. Breathe in the heavenly aroma while the beef cook…. for 3 and half hours or until beef is tender. Start garnishes 30 minutes before serving. Heat 1 tbs oil in a frying pan over high heat. Add bacon and cook, for few minutes until browned. Drain on paper towel. Melt 40g butter in pan, then add mushrooms, cook for 2 minutes each side or until tender. Transfer to plate. Add remaining 1 tbs oil and eschalots to pan and cook for 5 minutes or until browned. Add 100ml of water, cover surface and cook for 15 minutes until liquid has evaporated. So the secret for mash potatoes? Butter, and LOTS of it. Also choose floury potatoes such as Desiree (my favourite) and make sure you season the mash well. 1kg of desiree potatoes (trust me, your guests will want seconds), cut into smaller chunks so it cooks faster, skin on. Butter, about 200g. Yes. I’m serious. I’ve used Unsalted in this instance so make sure you check that and season accordingly, and use the best butter you can find. In a large pot, bring salted water to the boil and cook the potatoes uncovered over moderate heat until a fork can be inserted into the potato easily. Drain immediately. Bring the pot back to stove and cook in low heat so the excess water will dry out. Pass the potato through a masher or a ricer, and back into the same pot. I’ve worked out a system whereby I pick up potatoes clockwise so there’s always empty space for the mashed bits, if that makes sense. Add milk (heat beforehand but make sure it doesn’t boil), and then add butter little bit at a time while mixing everything together. Season with salt. Taste as you go. You’ll know when it’s perfect. 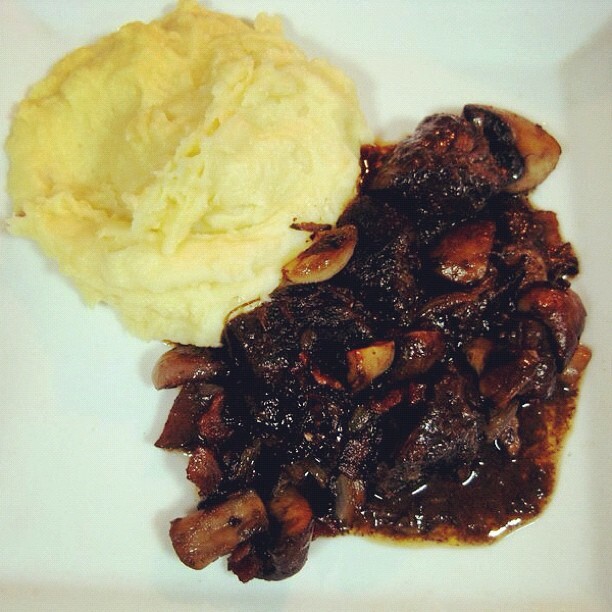 Divide daube among plates, scatter with bacon, mushrooms and eschalots. Spoon enough mash next to the beef. We are ready to serve! Be ready for that first bite, enjoy it with eyes closed. 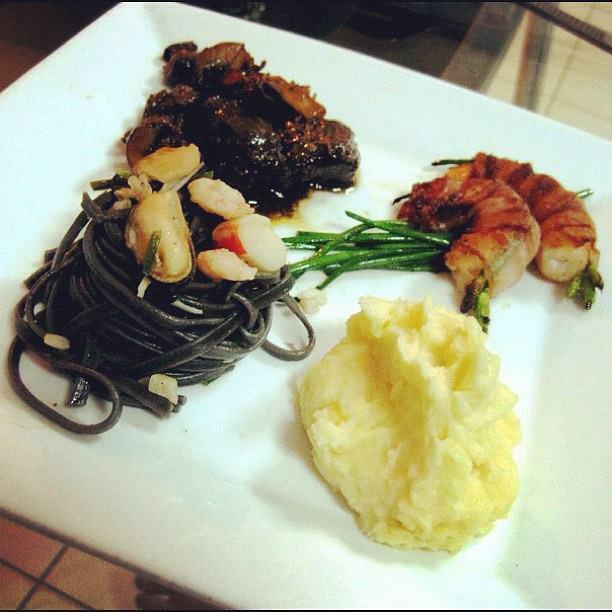 Special thanks to David who contributed Squid Ink Pasta and Prawns wrapped with Pancetta and Chives. Looks so pretty! Are you sure this is not from a fine dining restaurant? Tasted as good as it looks. .. Still the happiest Crash Test Dummy in the world.